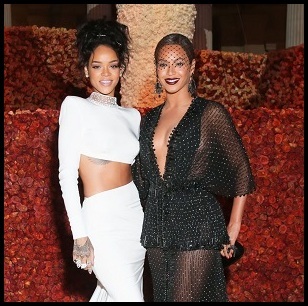 In the newest issue of Elle magazine (accompanied by Rihanna's cover spread), sources close to the singer reveal to the glossy that fans should “not be surprised” if a single is forthcoming this month. They refused to disclose further details. This would imply the single is ready to drop from now and three weeks. There have been certain hints to imply she has something planned. For example, her return to Instagram, her multiple magazine covers, her 'Concert for Valor' performance on November 11th, her rumoured X Factor performance and of course this little piece of tea right here. 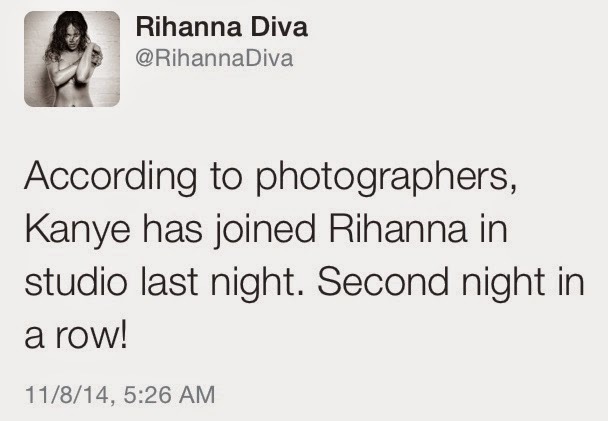 Interestingly, Rihanna was spotted heading to the recording studio this week. I mean, if she's planning to release her album this year, shouldn't she be wrapping things up by now? 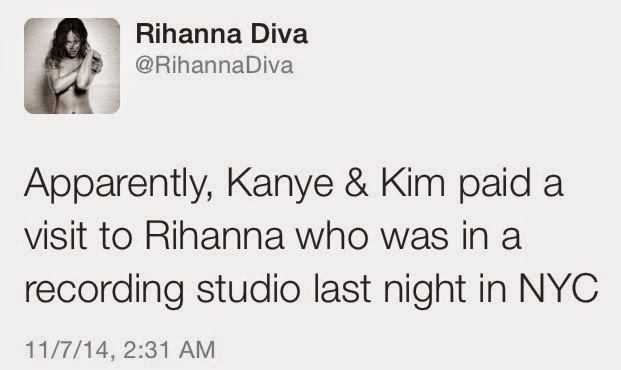 According to Rihanna Diva, photographers spotted Kanye West joining Rihanna in the studio on November 7th, two nights in a row! Kanye reportedly showed up to their recording session with wife Kim Kardashian.